Guess who's back in the spotlight? Heather was so excited to have the opportunity to answer some of the questions that were submitted after her interview last week. So, without further ado, I present you the star of the Scottie Mom blog tonight: Heather. Hello again, Miss Heather. How are you on this lovely Friday evening? GREAT! So glad you're home again. You really should consider taking me wherever it is that you go all those long hours every day. I bet it would be a lot more fun, you and me hanging out! Agreed. But what about Mr. K? Don't worry about Mr. K. He'll get plenty of attention next time around. So which question would you like to address first? 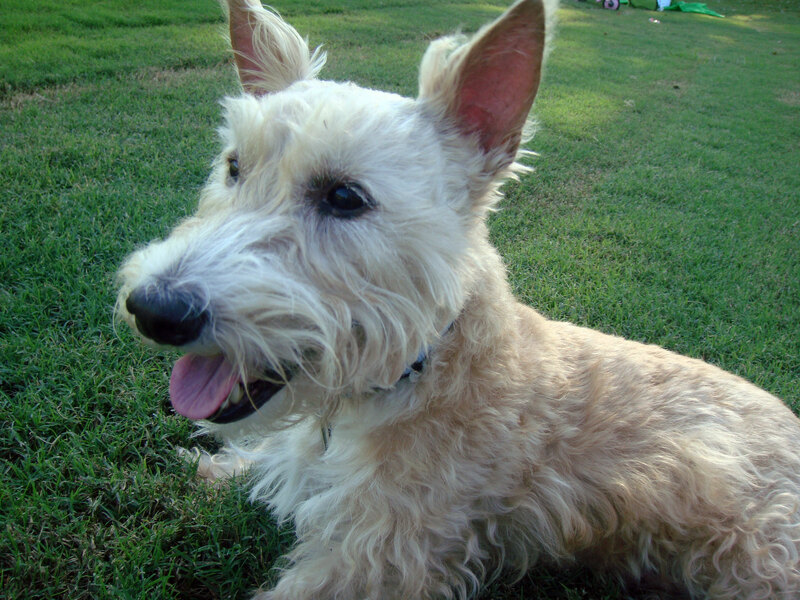 I'd like to talk to Hootmon first because he's a fellow Wheaten and we wheaties gotta stick together! Poor Hootie seems bothered by the fact he doesn't ArRooOo. Well, Hootie, I've got a secret for you: I don't ArRooOo either! (And neither does Mr. K.) Like you, Mr. K barks from time to time but mostly, he does this weird whine/whimper whenever he thinks he hears a noise. Scottie Dad hates it. He shakes his head, tells Mr. K to try not to cry so much and that he should be more manly, hehe! Hootie, neither you or your Scottie Mom should feel badly that you don't ArRooOo. In fact, I think you and I are doing the world a favor. 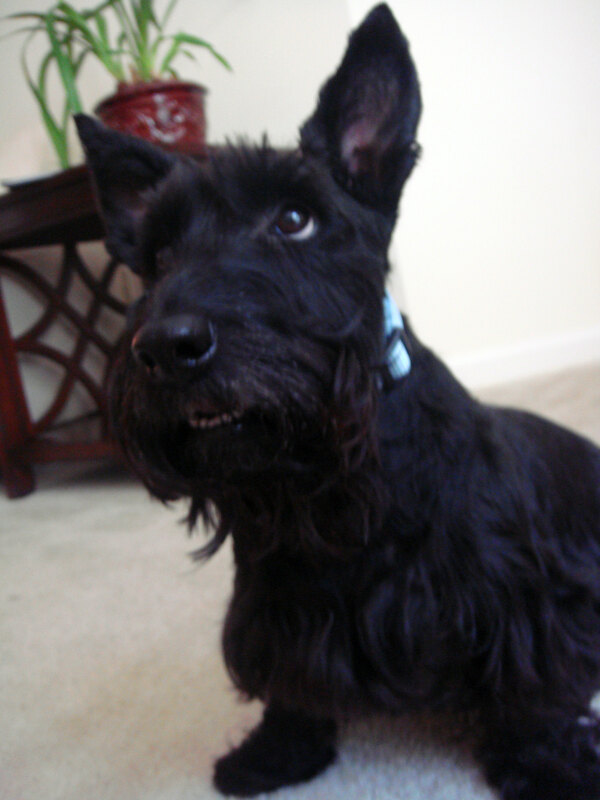 You see, if too many people knew about the Scottie ArRooOo, there'd be nothing special about it. 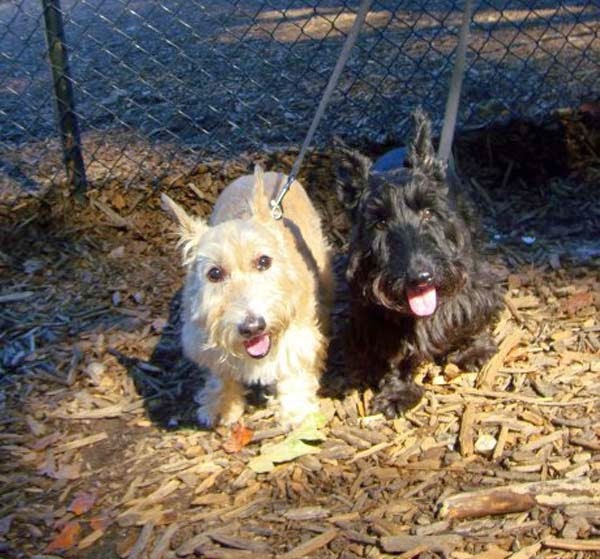 I'm sure we've both got it in us, deep down somewhere and should the time ever come when the Scottie world really needed an ArRooOo, we'd probably offer one up...unless we had a really bad day that day and Scottie-tude prevailed. Plus, I really don't think it is necessary to ArRooOo anymore, except maybe to entertain those silly hoomans. 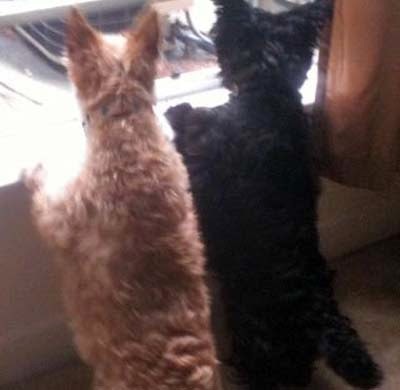 I'm pretty sure the only reason we Scotties started ArRooOo-ing in the first place was to alert our hoomans when we'd hunted down a great meal for them. 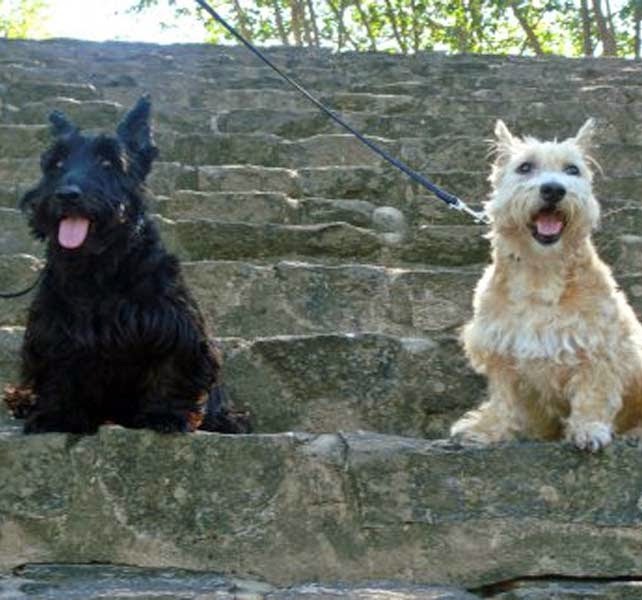 But, that was when we Scotties first roamed the Earth and we are much more civilized and too distinguished now to do something like that....unless it is a squirrel, of course. I could be wrong, though. After all, I'm only going on eight years old, you know. My last piece of advise, dear Hootie, is to tell that Scottie Mom of yours that ArRooOo's are patented by Scotties and should never be attempted by hoomans. End of story. 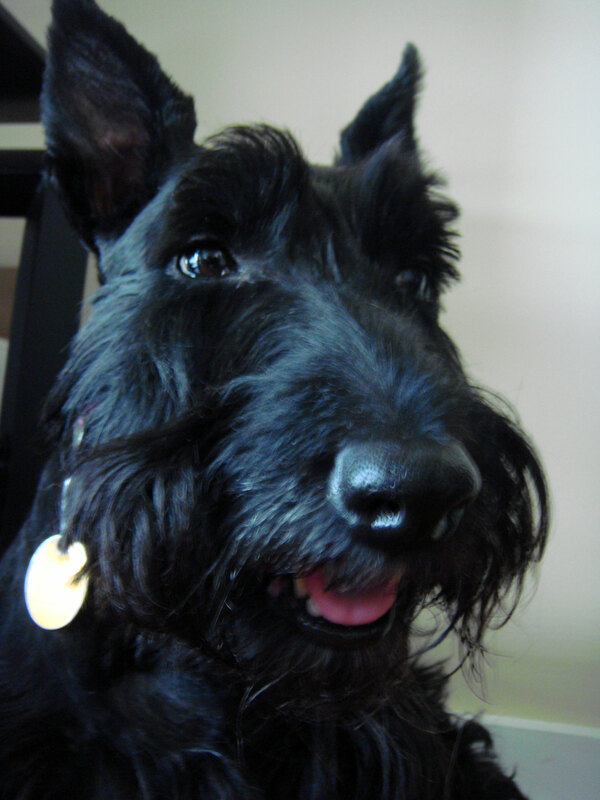 Oh, and I would love to take you up on your Scottie date proposal. Too bad you live so far away. 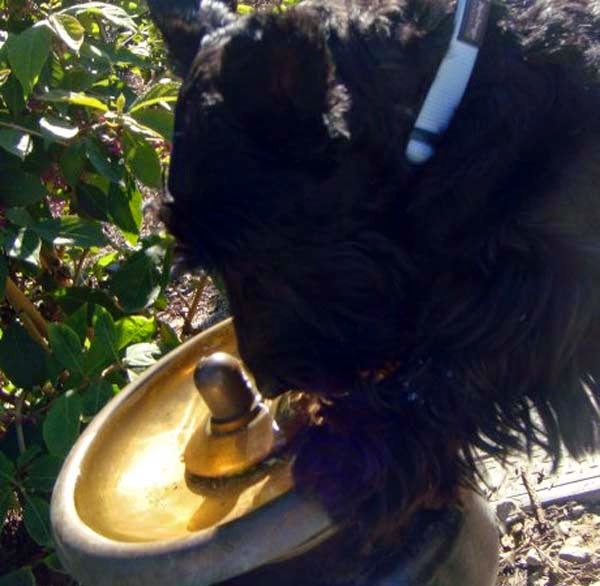 There's nothing I like more than time outdoors with treats and fresh water! 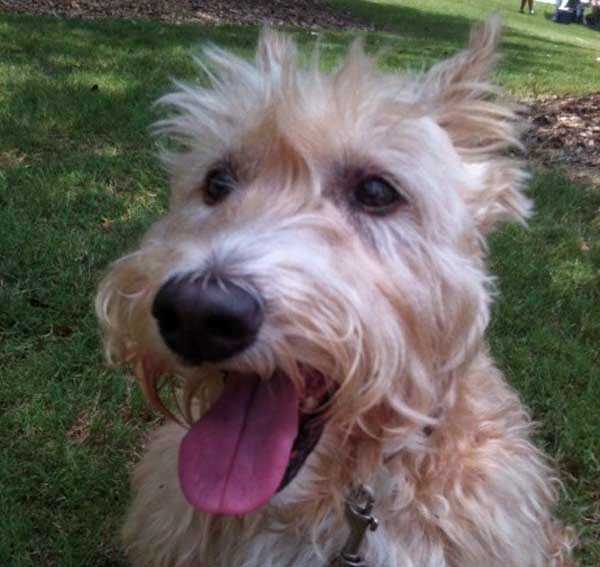 Ok, onto the question from Maggie's Scottie Mom. She wants to know more about your recent health scare. Oh, goodness. That's a loaded topic. 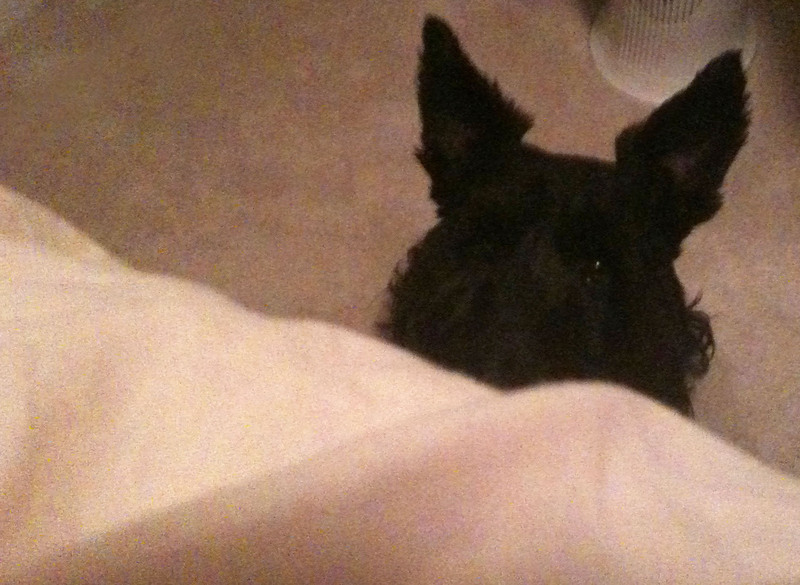 First, I would have to recommend Maggie's mom read all about how my Scottie Mom noticed I was sick here. Then, I would also ask she check out Mr. K's evil sickness, too - though my liver values were a bit higher at the time I was taken to the hospital, Mr. K's pulse was barely there by the time he got help. The vet seems to believe I had the same problem as Mr. K (which remains a mystery, I might add, since neither of us were given a formal diagnosis), but the way I showed I was sick was very different. For instance, my only problem was that I couldn't hold my bladder and would pee massive puddles every few hours. Mr. K's problems advanced so suddenly and yes, he was extrememly lethargic. If you ever want to see my Scottie Mom panic, just have Mr. K act the way he did that night. I've never seen Scottie Mom cry so much in my life! We both had plasma transfusions and stayed just shy of a week in the hospital during our respective stays. Mr. K's ultrasound showed internal bleeding of the abdomen and while there was some fluid in my tummy, there wasn't nearly as much as his. My gall bladder, on the other hand, remains enlarged to this day and one of my liver values has normalized (down from about 3,000) while the other has decreased to just above 600. Several medications helped me get back on track including denamarin, vitamin k, amoxicillin and metronidazole. Mr. K had a similar mix of meds. So yes, I've certainly come along way but the vet wants to keep an eye on something she calls sludge living in my gall bladder right now. 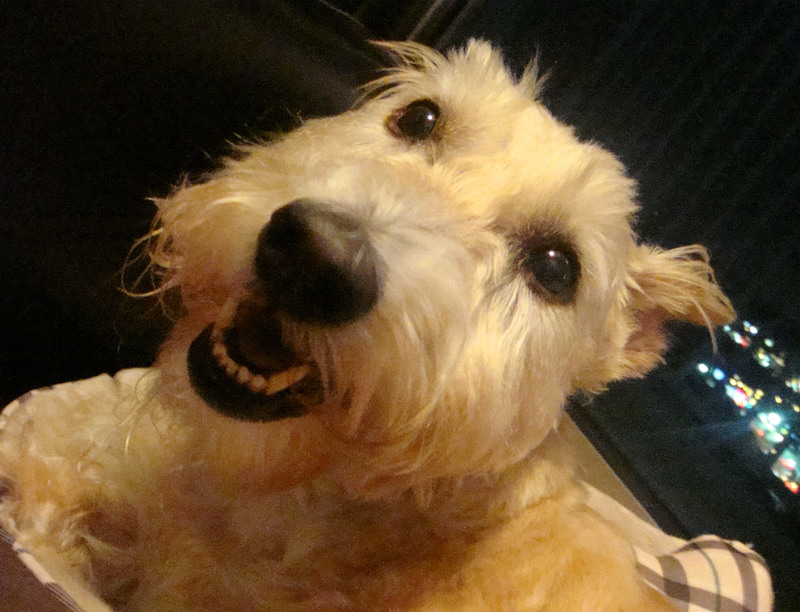 Other than that, I'm one seemingly happy and healthy pup! Yes, you are! You and your brother did so good, fighting your way back to good health. 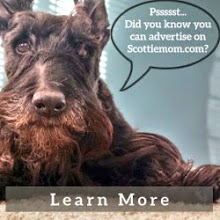 You certainly have one proud Scottie Mom here. Thanks so much for your time, sweet Heather. It was very nice of you to take time out of your busy Friday night. Don't you be silly, Scottie Mom. This is so much fun and it is entirely my pleasure. I only wish I could share Scottie kisses with everyone who reads my blog, especially those that submitted questions last week. 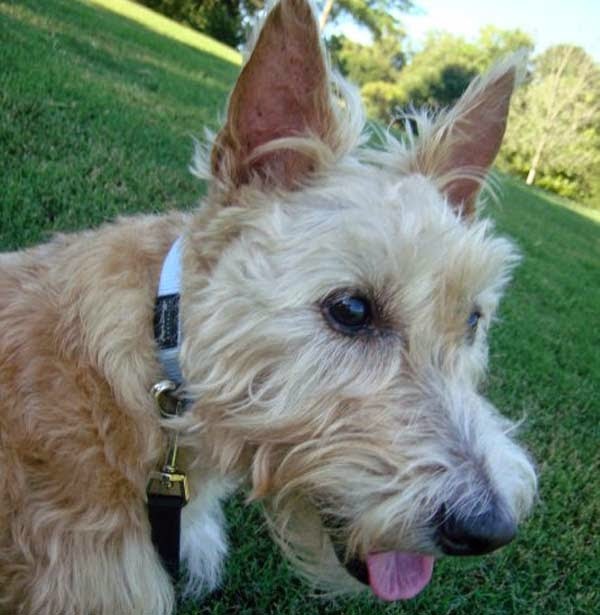 (Extra Scottie love goes out to Hootmon and Maggie's Mom tonight!) Well, I suppose I should be off. I've got one more walk to take and one final night to enjoy in the forbidden hooman's bedroom before Scottie Dad gets back. 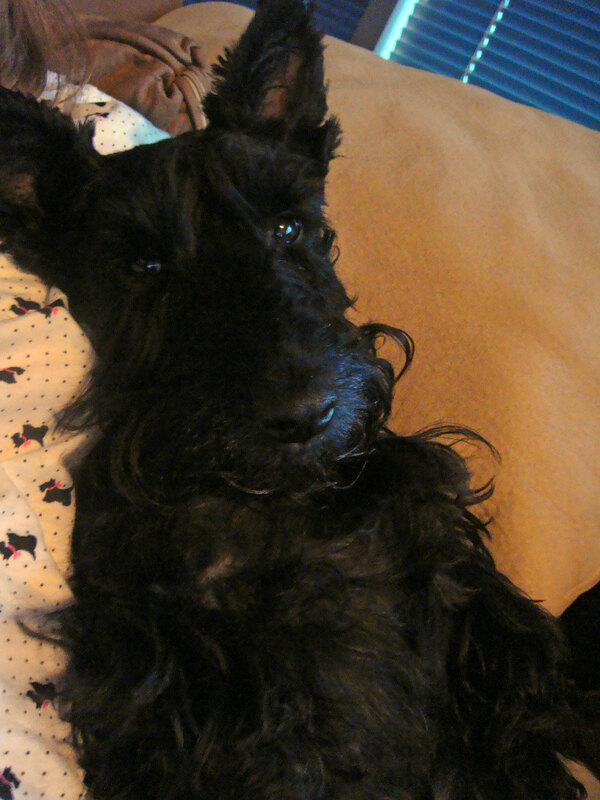 Night, night fellow Scotties and their pawsome hoomans! Keep the questions coming! Last week, Heather was all "bottoms up." 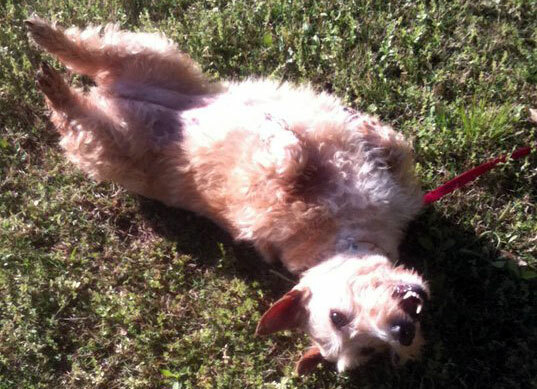 This week, she's gone completely "belly up!" 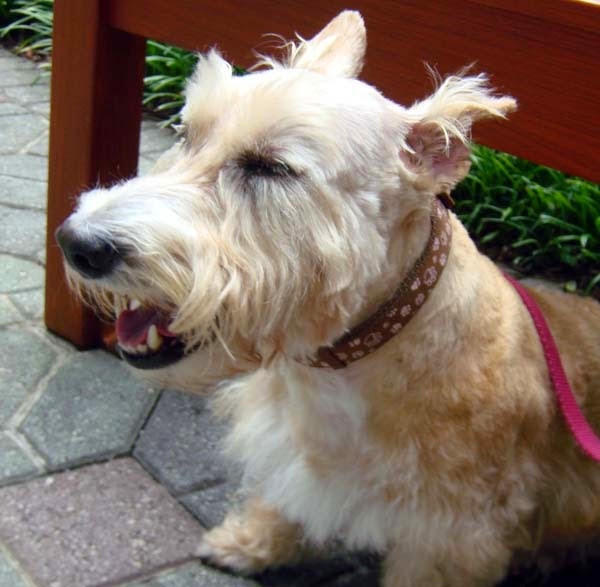 Once again, we're participating in BlogPaws' Wordless Wednesday, a popular Internet practice of posting a photo on your blog that requires no explanation. I'm pretty sure we all know what Heather's up to in this photo...luring us in with all her super cuteness to score some extra affection. How many belly rubs do you think she convinced people to give her while posing for this photo? 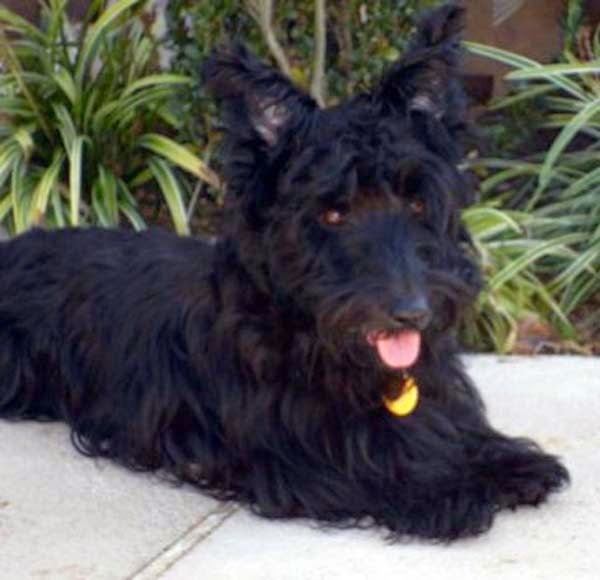 You simply haven't experienced the epitome of cuddly cuteness until you've seen a scruffy Scottie. Seriously. 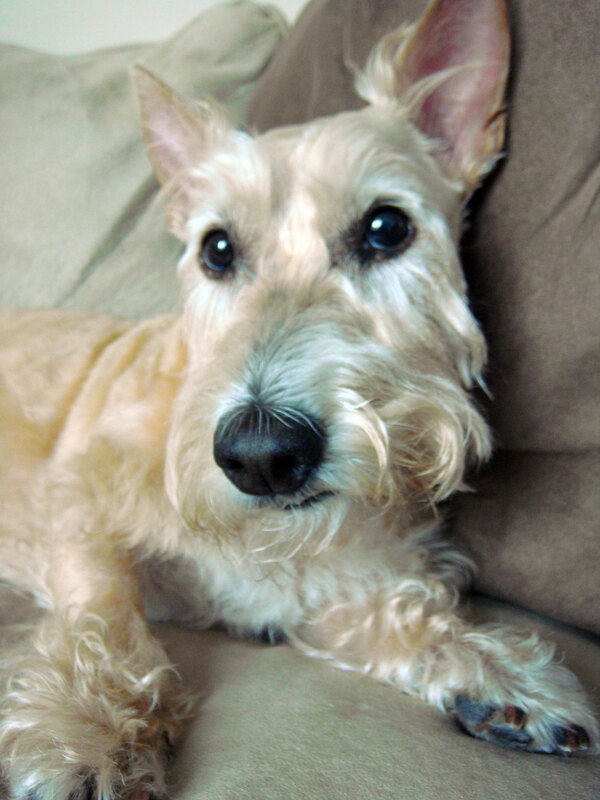 I used to prefer Mr. K a little on the scruffy side until Scottie Dad came along and made me realize how much easier it was to keep the apartment clean and the shedding to a minimum by taking them in for more regular grooming. Still, every now and then it is fun to see how Heather's and Mr. K's hair can grow! Although, I must admit, Heather's doesn't grow nearly as fast and Mr. K looks like a giant ball of fur by the time Heather even begins to get that scruffy look. And, since it has been a while since I've seen them so scruffy, I decided to gather some of my favorite photos of Heather and Mr. K during their scruffiest times. Enjoy! Hello again, Mr. K. I understand you have some unfinished business you'd like to address with everyone. Yes, after seeing dear Heather's interview last week, I felt it was necessary to go on the record and set things straight. After all, I have a reputation to uphold and she called me crazy...and a whimp. She called me a whimp. 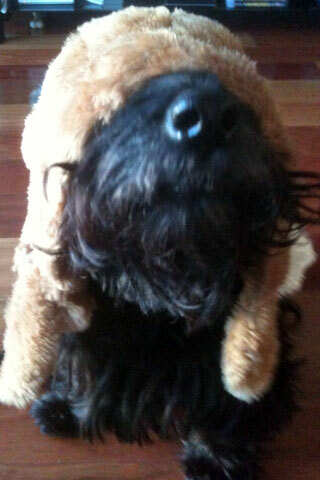 Obviously, that's blasphemy and I can't have my new Scottie friends thinking anything of the sort. 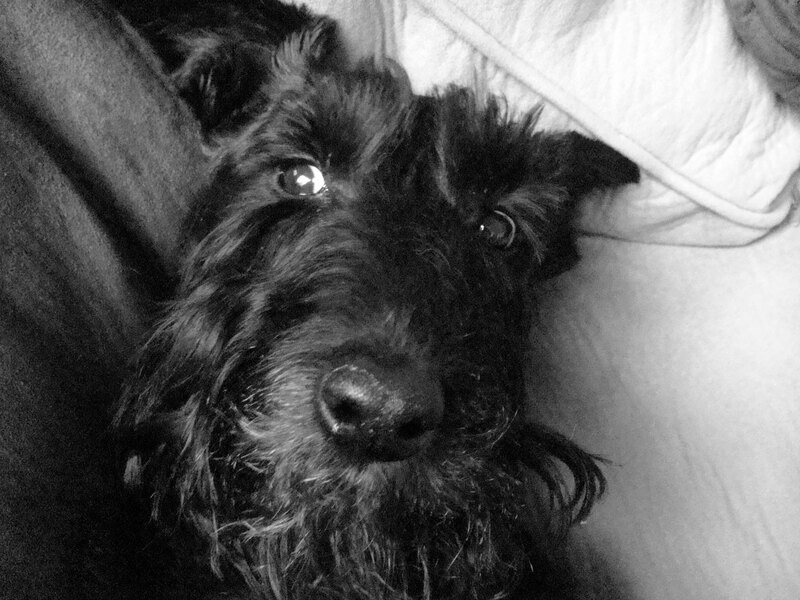 Let me tell you how it really is: you see, when the lady Scottie entered this household, of course I wasn't happy about it, at first, but you taught me how to be a gentleman. I only let her think she's in charge now because I've learned so long as the women in the household are happy, everything is much more peaceful around here. Ordinarily, I'd say you were a smart man. 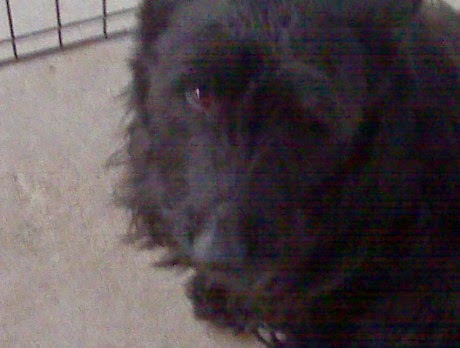 However, I find it hard to believe you let Heather steal your food and your cuddles with Scottie Mom and Dad? That's what I thought. Ok, moving on. Was that all you wanted to say? No. 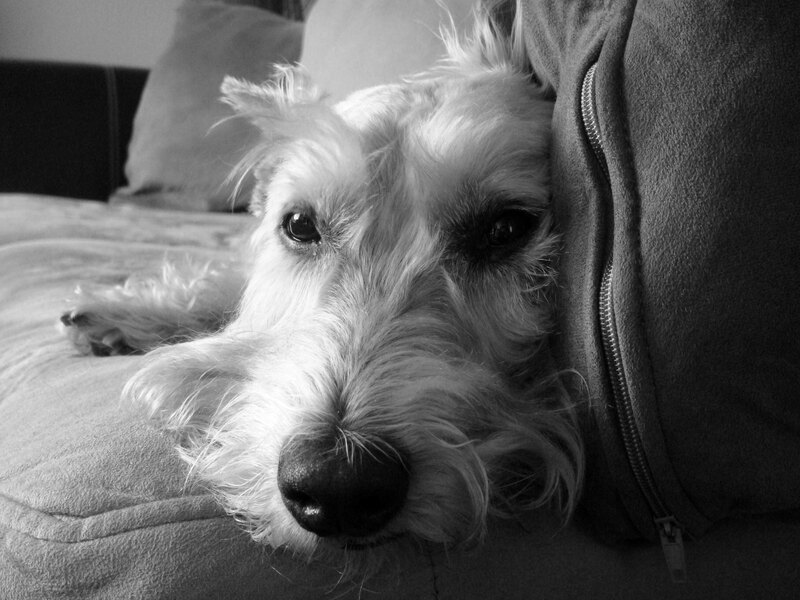 I also wanted to say thank you and WOOF WOOF to all my new friends. Well, for two things. First, I don't know if you've told them yet but I recently found out our blog surpassed 5,000 views. (Can I get a Hip-Hip-ArrRooOO?!?) 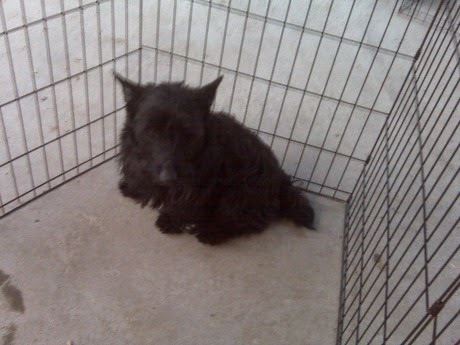 Second, have you seen the number of Scottie photos submitted from across the U.S. and around the world? I had no idea there were that many of us, all good-lookin', too...of course, not many can hold a candle to me but that's just the way nature intended it to be, I suppose. Mr. K, don't be rude. 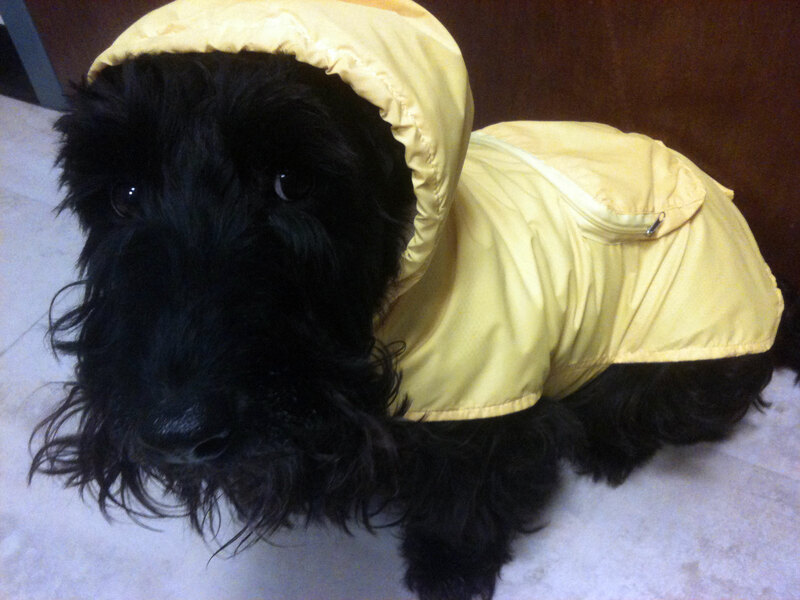 All Scotties are created equally as cute...haven't you seen how similar Scotties look sometimes? I'm outraged! How could you say that, Scottie Mom? We're all so different! But yes, I do think we are equally as cute. 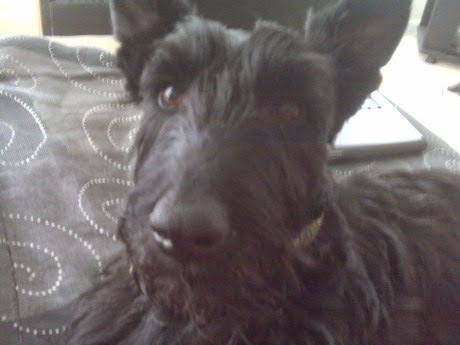 It's just...I didn't want any other Scotties stealing more of your attention from me. For the record, I wasn't being rude. There's nothing wrong with expressing a little confidence. Gee Scottie Mom, way to be a buzz kill. You've been talking with Scottie Dad too much. You're starting to sound like him. Ohhh, snap! I'm gonna tell him you said that! Ok, say goodbye to your treats. Oh. Snap. What did you say again? See, I already forgot. Now, where are those treats again...? Hidden. Now, Mr. K, let's get back to Project: International Scottie Love. 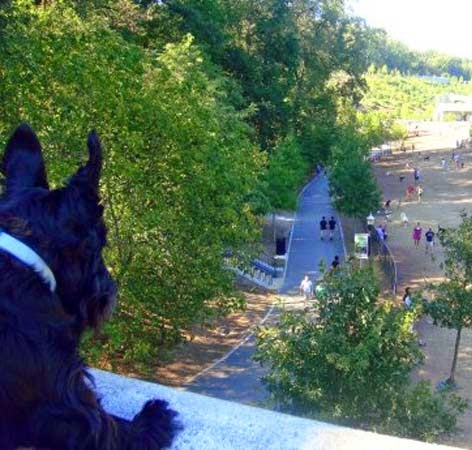 Which place do you think will win the most popular with Scotties on earth? What about Heather? Do you know who she's rooting for? How could I not? 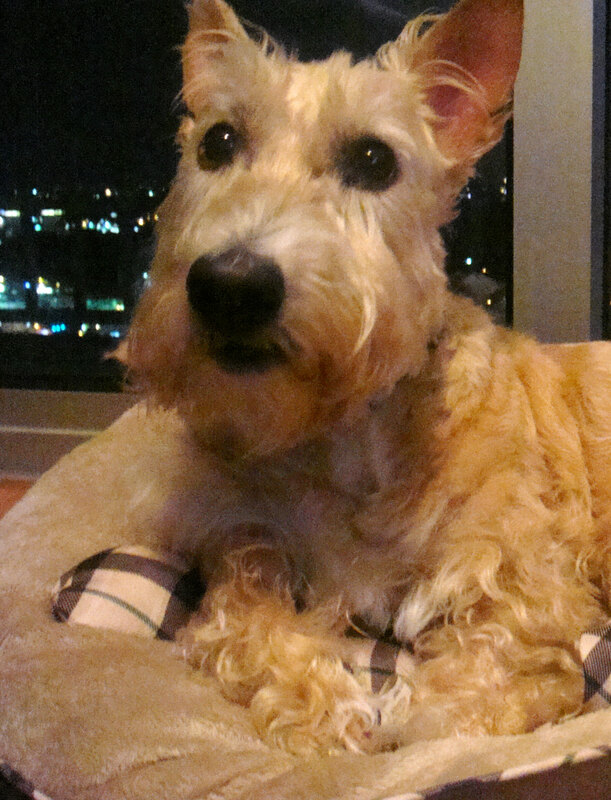 She goes on and on about that Peruvian Scottie named Plutonio. Apparently, the silly hooman man that gave her a kiss a few weeks ago hails from Peru so she's hoping to see some more Latin American Scotties come out of the woodwork. As for the States, Heather's definitely going to lose that bet - she's choosing a state who hasn't even entered yet: Tennesssee. That's where she was rescued and apparently, there are quite a number of fellow rescue Scotties still looking for furever homes living in that area right now. Interesting. I guess we'll just have to wait and see how it all plays out. Any last words before we wrap up this interview? Yes. 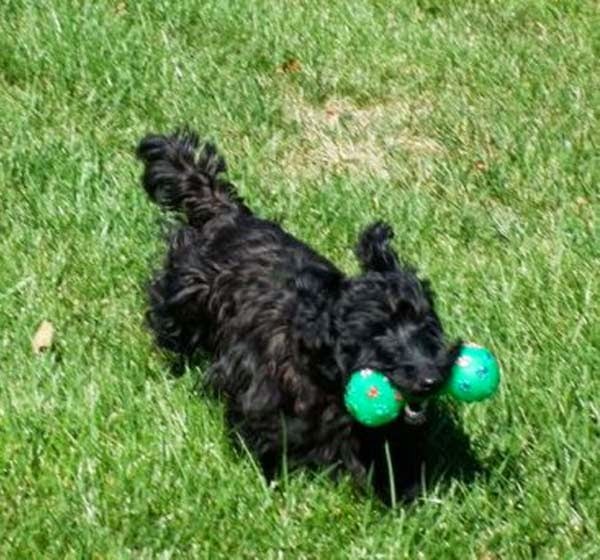 I want to tell my Scottie friends to have a wonderful weekend, to enjoy themselves and to give some love to your Scottie Moms and Dads for me. We're headed out on some mini-adventures ourselves this weekend so be sure to check back for some pawsome photos! Happy Scottirday!! Heather cannot decide whether to be a fish or an ostrich...how about ostrafish? Heather, Mr. K and I will be walking toward a green space when Heather starts picking up the pace a bit as we get closer and that helicopter tail of hers takes off. 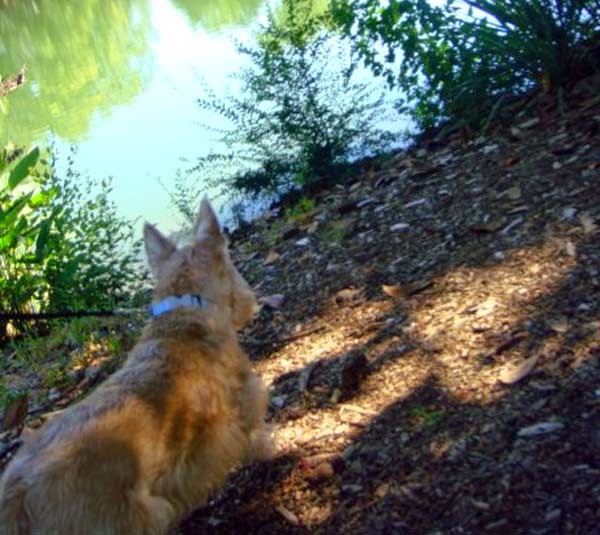 As we reach the treasure island of fresh, green grass, Heather doesn't wait a second to dive in - literally, head first. Scottie Dad and I have coined this move "the fish" and "the ostrich," depending on how Heather decides to execute it on any given day. For example, when she decides to be a fish, she swims through the grass, using her back legs to propel her body through the strands of grass, sliding this way and that. When she's an ostrich, it appears as though Heather is trying to bury her head in the ground. She sticks her bottom in the air, touches her head to the ground and moves it from side to side, occasionally using her front paws as if she was digging the ground around her head. A girl's first kiss is never forgotten. For some, it is a magical experience that stands the test of time. For others, it's just an awkward memory better left behind and never mentioned again. Either way, a first kiss is a pivotal moment in any girl's life and this weekend, Heather added her first reciprocated kiss to her list of milestones achieved since joining the Scottie Mom family a year and a half ago...and even better, she didn't have to steal it! Scottie Mom and Dad hosted some friends from out of town this weekend and as per usual, it didn't take long for Heather to work her magic and win over the guests. 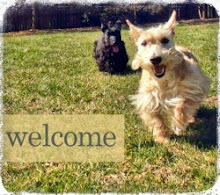 From the time they arrived on Friday afternoon, it was clear Scottie Dad's friend was smitten with the pups. Scottie Dad's friend would call Heather and coo over the little girl walking back and forth with her tail wagging so hard it was moving in circles. Clearly, Heather was just as smitten with him and even dared to join Scottie Dad's friend on the couch (a rare gesture on her part) not once but twice! 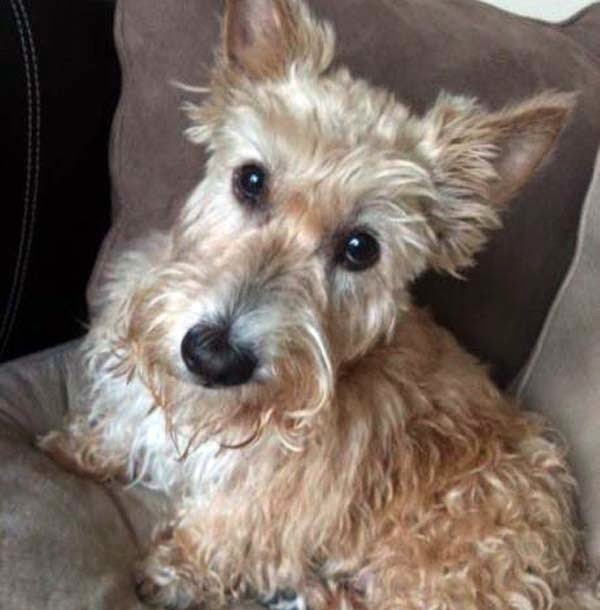 On the third and final night of his stay, Scottie Dad's friend offered up a kiss to sweet Heather and, with just a second's hesitation, she graciously accepted. It was a series of quick kisses on the lips and I dare say I'm afraid she may have snuck a little tongue action into the kiss as well, but Scottie Dad's friend didn't seem to mind. (This might be a good place to point out the human girl who was seen stealing kisses from Scottie Dad's friend earlier in the weekend did, in fact, mind and was not pleased to witness Heather stealing her man in this magical moment.) Alas, the kiss was short-lived but I am certain it changed Heather's life and will remain in her heart forever. 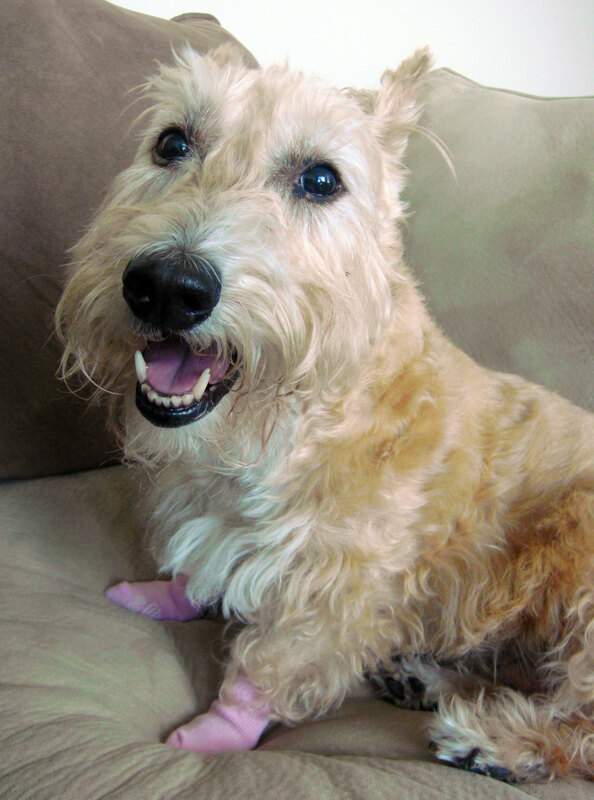 Let's hear a hip-hip-ArrRRoOOo for Scottie love, people!